NOT about cleaning!! About #Methane migration. #Seismicity @edgray1906 @Fishcreek1269 @gardencatlady #Cement CRACKS/SHRINKS over time. Do you think we can put this genie back in the bottle? The horizontal orientations introduce different gravitational effects compared with vertical wells. In a typical vertical well, where there is a large column of cement, some migration of the solids downward or the water upward does not cause a significant change in the cement properties. In a horizontal well, the solids migrating to the bottom of the section and the water migrating to the top can provide areas of the well that do not have a complete seal. If the water in the cement separates from the mixture before the cement is set, it can migrate to the top of the wellbore and form a channel along the top of the wellbore which can allow migration of formation fluids. If the solids in the cement mixture settle to the bottom of the cement before the cement can harden,the solids can cause the cement to not set up correctly and the weakened area along the bottom of the wellbore can fail under pressure during stimulation activities. (Salehi and Paiaman, 2009). The long history of the Corn Valley Drilling Site seemed to be coming to an end after last Monday's 8-0 Planning and Zoning Vote. However, we were baffled when watching the re-play of the meeting...baffled as to why there was no mention from anyone about the United States Army Corps of Engineers (USACE) and Grand Prairie, TX MORATORIUM. And with some of the other statements during that meeting. As a reminder, this drilling site's well is 850 feet (literally across the street) from the Joe Pool Lake Dam and Spillway. A 3,000 Ft. Exclusion Zone for drilling activities near USACE dams was in place since 1996, but it was ignored by Chesapeake. Or they didn't know about it. Or they didn't care about it. They told the city that USACE knew about their plans back in 2010. That controversy has had many headlines over the years and yet this Planning and Zoning Commission made no mention of any of that. Was the United States Army Corps of Engineers (USACE) informed about the planned plugging of the horizontal gas well? Seems that is definitely a gas well drilling activity. There was a workover rig on the site as you can see from our previous Westchester Gasette blog post, here. So...this zoning change was approved so that a developer can build 55 homes right there in the shadow of the spillway and dam and atop the drilling site. Interesting that this housing developer made a derogatory statement about our Westchester Association of Homeowners. How very weird was that? And more weirdness followed. Watch the meeting at the link above. Oh, what a tangled web. We'll have more about all of this and other developments, soon. It's always a doozy in gasland. From the moment Chesapeake's Landmen came to South Grand Prairie, TX (in Southwestern Dallas County) and began encouraging homeowners to sign over their mineral property (around 2007 and for as little as $150.00) most of us had no idea what our community was in for. Thank you, Westchester-Grand Prairie Community Alliance, for all the hard work over the past 4 years. Recommending changes to the city's Gas Drilling Ordinance was a daunting task that we all worked hard to accomplish. 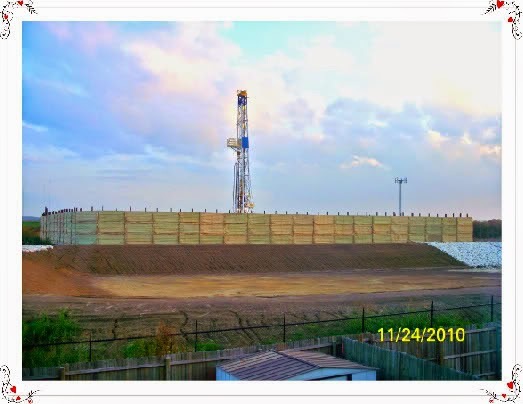 We were motivated, in part, when Chesapeake dug out the monster FRAC Pond right behind Rosemary Reed's home and behind others' homes in the Westchester Valley neighborhood ~ without notice on a very HOT, August Saturday and Sunday in 2010. Since most all of our neighbors on Donnie Lane had refused to sign leases, that alone was an insult. The operation shook the homes and caused sheer TERROR for our Westchester Valley neighbors. We understand that two of our neighbors (with already compromised immune systems) died within weeks of the FRAC Job conducted 537 feet from their back fences in January 2011. With that in mind, there is very recent news that the Flower Mound, Texas cancer cluster needs another look by our state and country. Read and see that story here. Of course, the amount of dirt and dust generated by the digging operation for the "Fresh Water" FRAC Pond, alone, would compromise very healthy immune systems. May our Westchester neighbors rest in peace. A community-wide meeting organized by WAHO and held at the Oaks Baptist Church drew hundreds of our South Grand Prairie, TX neighbors on July 19, 2010 with reps from environmental groups, the city, Chesapeake and even the Mayor of Dish, TX (Mayor Calvin Tillman). But none of this swayed Chesapeake whatsoever to reconsider what they were proposing at the southern entryway to our Westchester neighborhoods. By the way, we understand that a housing developer has already expressed plans to purchase the land from the church with the ever-changing name immediately next to the Corn Valley Drilling Site and build beautiful, new homes. Yes, that's right. The fact that this same land at 210 W. Camp Wisdom sits 850 Ft. from the mighty Joe Pool Lake Dam and Spillway is also a concern. As you might guess, we do have several issues with all of this and we will be discussing it here on the blog in more detail, soon. 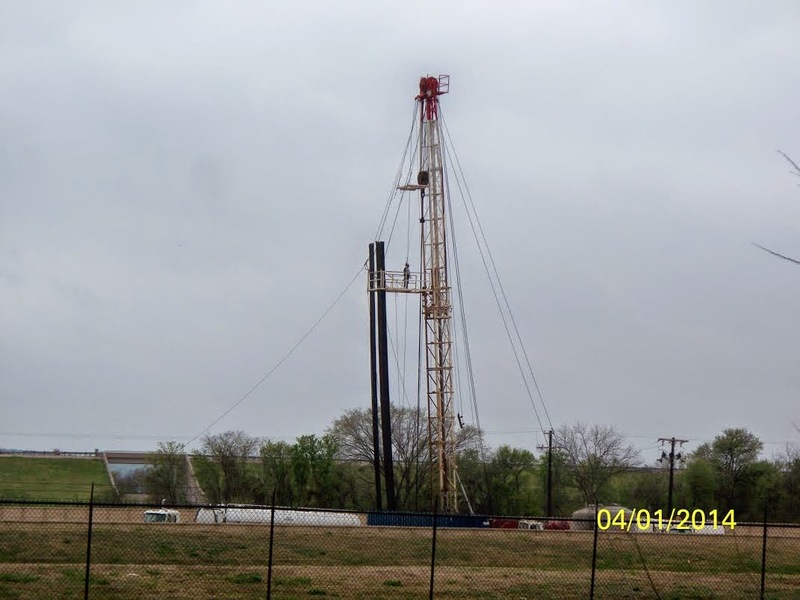 As has always been the case, many of the specifics about neighborhood, unconventional drilling operations have never received proper discussion in our city or state's public square. Recent man-made earthquakes in the Azle, TX area northwest of Fort Worth seem to have caused the Railroad Commission of Texas to go off its sturdy, old tracks. Click here for the Texas Statewide Rule §3.14 for Plugging. 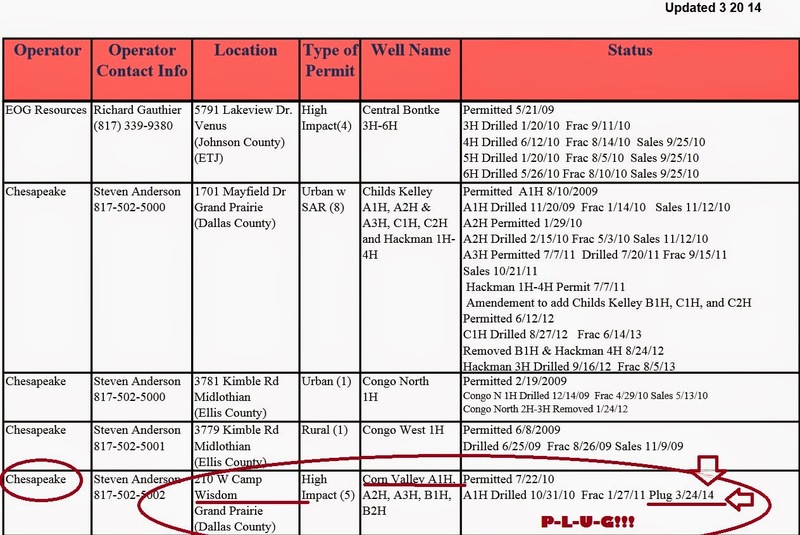 We are not aware of any Grand Prairie, TX specifics for "plugging" according to the GP Gas Drilling Ordinance. But we are always open to enlightenment. We do hope Chesapeake and the Cementers do it right. We have every confidence they will!